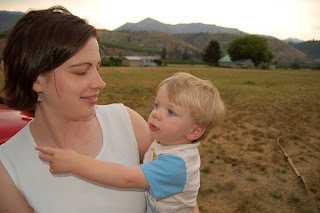 My poor little son, Cory, has had a fever since last night and is pretty darn miserable. It's not high enough to take him to the doctor although I do hope it goes away soon. Today he alternately laid in his bed and whined or laid on me and sucked his thumb. I guess I don't mind the snuggling, but I don't like to see him so sad. 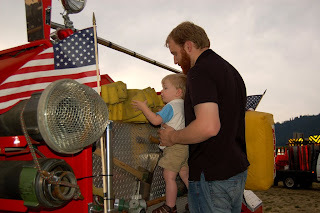 He was much better on Tuesday night when we went to the firemen's party that Grandpa Derald bought him at the auction in March. 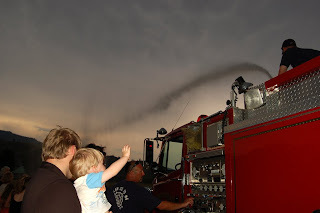 We got to ride in the fire truck (lights flashing, horns blaring) around to a big field so they could shoot some water. Cory was fascinated by the lights! And by just about everything. 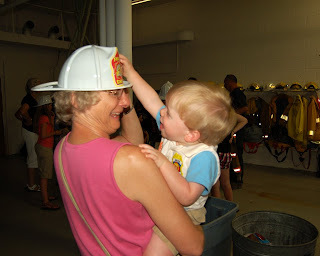 The party was courtesy of the Dryden volunteer fire department. 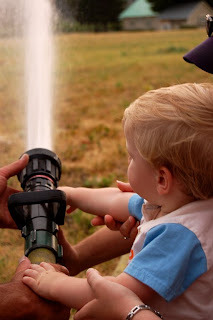 Cory even gets a chance to help spray some water/foam from a hose! 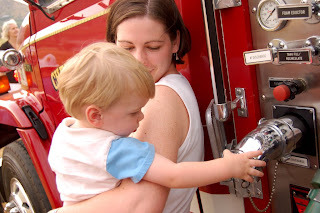 And then Daddy helps him check out one of the other engines that had hose on the back ready to be laid to a fire. The is the biggest water hose they have. The truck holds 1500 gallons and it can be emptied in under 3 minutes. That's a lot of water! After the party we went up to Great Grandma's place for an early 4th of July dinner. Cory ate half of Grandma's dinner and then I had to share mine with her. I have a big eater for a son! 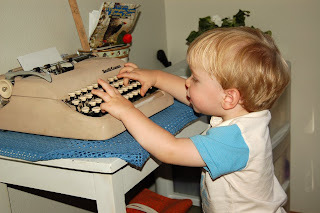 After dinner we went up to her room and Cory found her old typewriter. He thought it was just for him with all those fun buttons to push! I sure hope he's feeling better tomorrow or this may be the only 4th of July celebration we have this year. 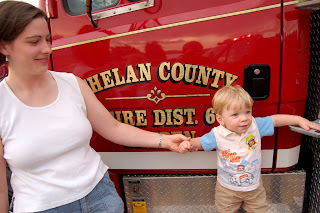 So I told my hubby about the fireman's helmet with our name on it, and he wants to know where you live so we can 411 him. HA! He thinks it's a long lost uncle (which I do have - my grandfather fathered him before he married my grandma but never met him).